Most projects fail because the interests and the requirements of stakeholders are given zero attention. 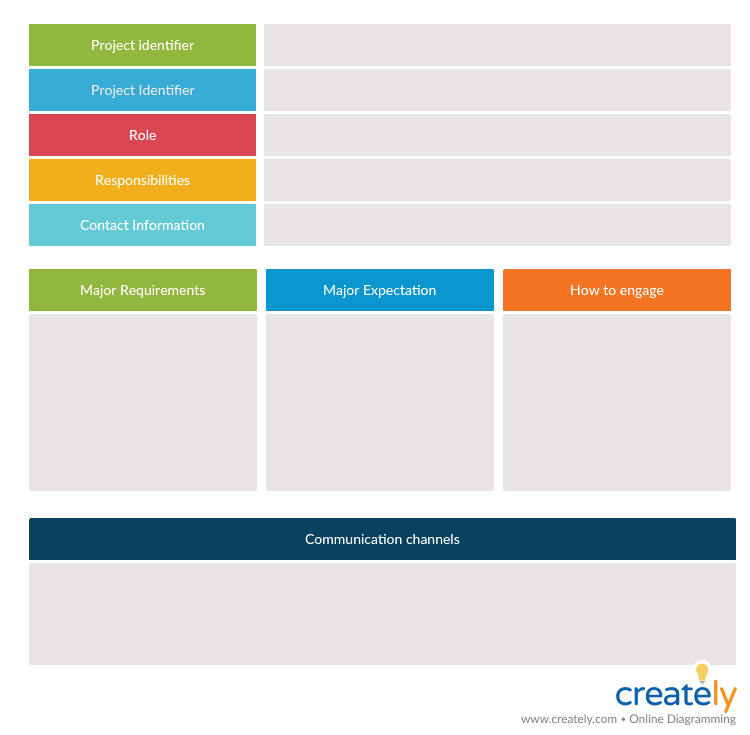 While your key stakeholders have the power to make your project fail, you need to have a proper plan in place to identify their needs and communicate and engage with them. Your stakeholder management plan should be a key element of your project planning efforts. In this post, we will look into what stakeholder management is and the different stakeholder management process steps. We have also introduced several visual tools that you can use during each phase along with editable templates. A stakeholder is someone who has an interest in or who is affected by your project and its outcome. This may include both internal and external entities such as the members of the project team, project sponsors, executives, customers, suppliers, partners and the government. Stakeholder management is the process of managing the expectations and the requirements of these stakeholders. It involves identifying and analyzing stakeholders and systematically planning to communicate and engaging with them. Following are the key steps in stakeholder management. Following through with these steps will help you effectively address the requirements of your stakeholders and keep them satisfied. First step is to identify stakeholders of your project. You can start by listing down anyone and everyone who is affected by the project. A mind map template like this can help you with listing them down. Once you have a full list of stakeholders, it is easier to categorize them. For example, you can group them as External and Internal. 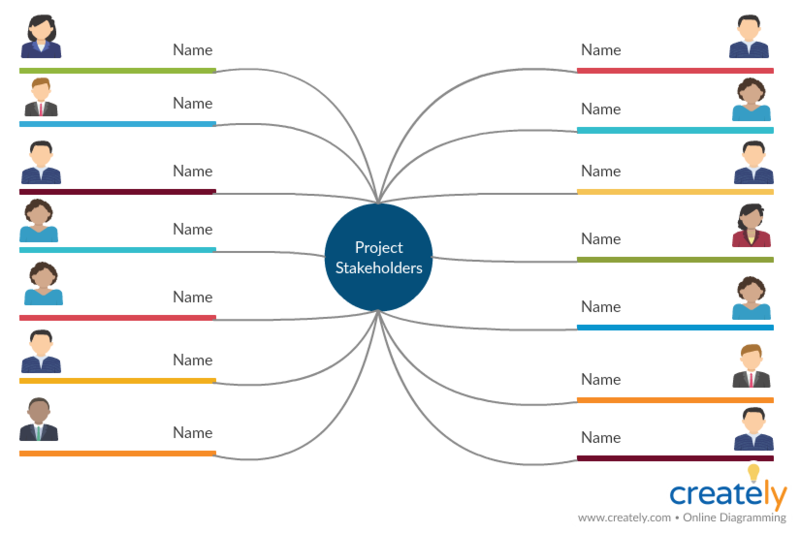 You can use a similar stakeholder map like the one above to do this. In this step you will be evaluating the stakeholders in terms of the power and interest they have over your project. By categorizing them thus, you can decide which stakeholders you should spend most and least effort on. 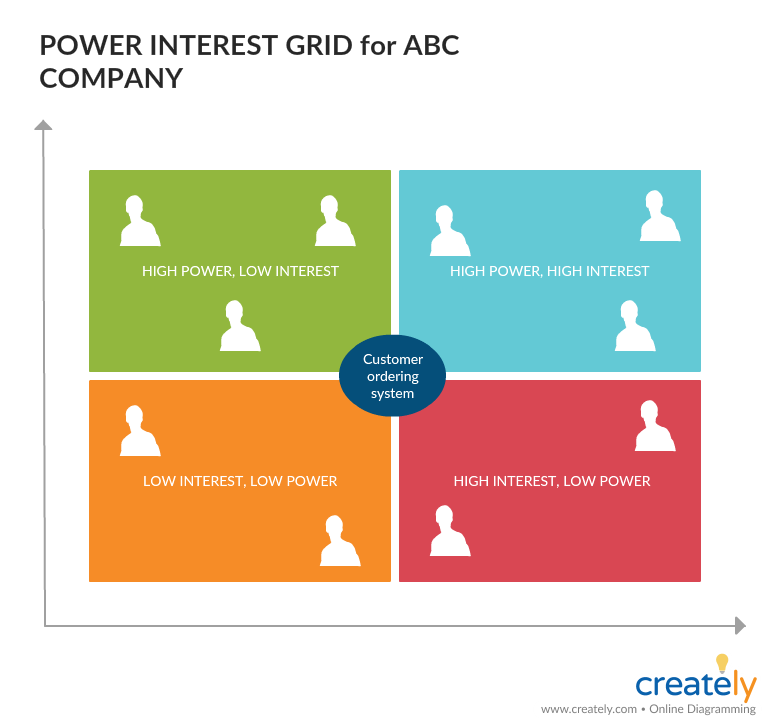 The Power Interest grid is the most widely used technique in stakeholder analysis. This tool helps you determine what you will communicate to your stakeholders and how often you will do so. The stakeholders you place on this quadrant are the key players. While you will have to spend the most effort on engaging with them, you should keep them informed at all times. Make enough effort to keep these stakeholders satisfied. But refrain from going overboard with your communication efforts lest you make them bored. Provide adequate information on the project to these people and ensure that they don’t have any issues with the project. Monitor these stakeholders and their interest in the project and provide them with adequate information without overloading them. 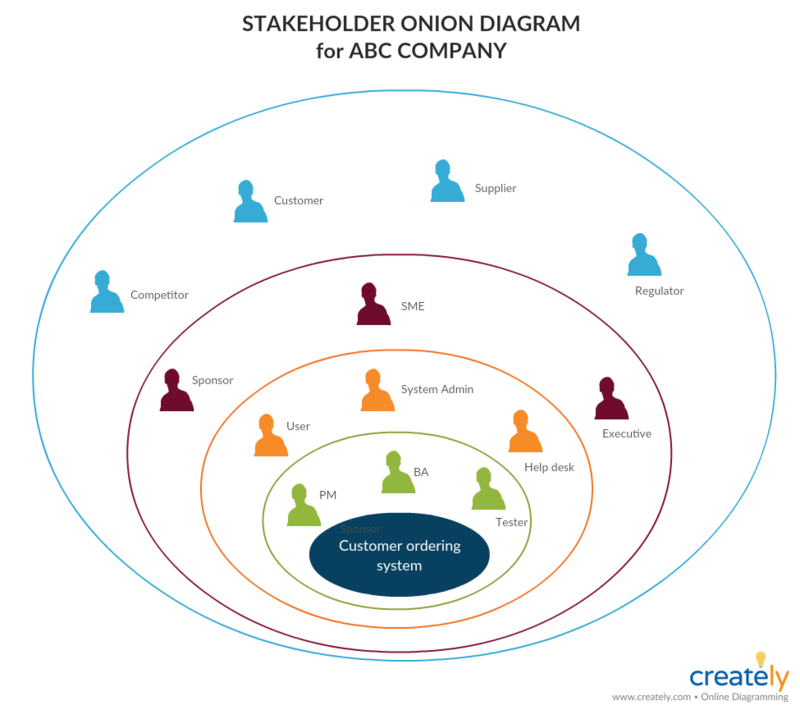 Now that you know where each of your stakeholder stands, you can use an organizational chart or an onion diagram like the one below to prioritize your them based on their importance to the project and their hierarchy. 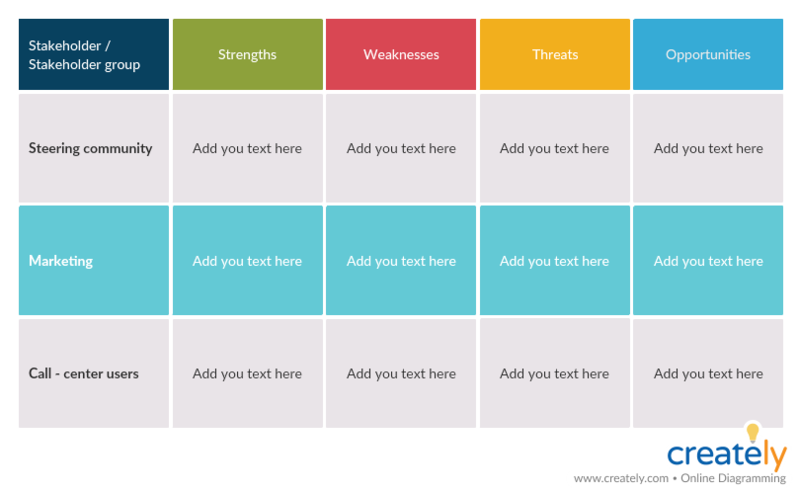 Another great tool to analyze the importance of your stakeholders and prioritize them is the SWOT analysis. With it you can evaluate your stakeholders based on their strengths and weaknesses, threats they pose to your project and the opportunities they can bring to successfully complete the project. Now that you have an idea about how and how often you should communicate and engage with your stakeholders, it’s time to create a plan to deliver the right message to the right stakeholder in a timely manner. Before you go about creating your communication plan, you should have a stakeholder profile by hand. These profiles (you should have one for each category of stakeholders) should list their needs, interests, goals, responsibilities, level of power and interest, communication channels etc. This is where you execute your communication plan that you have created. While actively engaging with the stakeholders, you need to constantly monitor them to identify whether they may have issues with any development of the project. Take necessary action to address them in order to get their continuous support. Also be careful to select a suitable engagement approach based on the type of stakeholder. For example, you can use costly approaches like face-to-face meetings, extensive consultations etc. with the stakeholders who has high power and high interest (the key players) in your project. Reserve the less expensive methods such as newsletter and emails for those who you should put minimum effort on. Then measure the effectiveness of your engagement strategy and apply necessary adjustments to improve it as needed. Any More Tips on Stakeholder Management? On top of your list or not, every stakeholder in your project needs to be managed and engaged with. Keeping them satisfied is the key to a successful project. In this post we have covered how exactly you should go about identifying and analyzing stakeholders and creating an effective plan for engaging with them. Also refer to our post on mapping a client communication plan to learn in detail how to create a successful communication plan for your stakeholders.